"We were born too late. Roper's already been here. 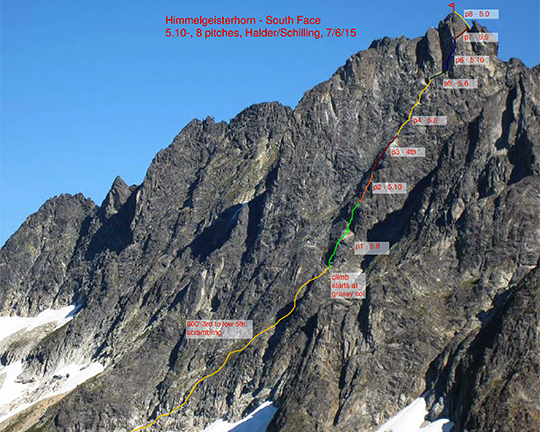 We're just picking up his scraps," said Tim as we gazed at the unclimbed South Face of the Himmelhorn (7,880') in the remote Picket Range. Maybe so, but neither John Roper nor anyone else had ventured onto the big face before us. We wondered why it was neglected as we tried to agree on a route while lounging among wildflowers beside Crescent Creek in a basin below the peak. I like to think that I've paid my dues in the Picket Range in North Cascades National Park, Washington. I spent three nights stormbound on the summit of Mt. Fury (8,280') with Donn Venema and Steph Abegg in 2008. Venema and I wore sleeping grooves into ice during that first bout of Picket purgatory. That night I woke up often with Venema's legs draped over mine or his hot breath on my neck. Fortunately we got along well. He invited me into the Pickets for three more trips in two years and became a mentor. The next year I returned with Venema and Abegg and new partner Steve Trent. 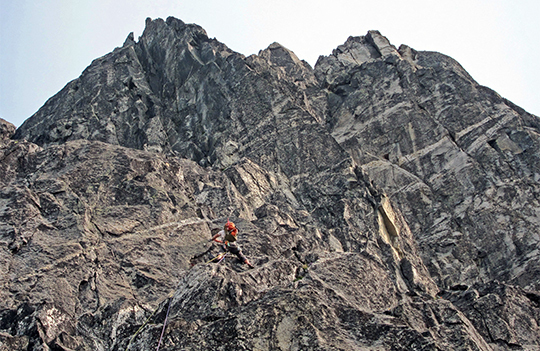 The trip ended when Trent was injured in a fall on the North Buttress of Mt. Terror (8,151'). I stayed behind to care for Trent, helping with his helicopter rescue and then spending four days in a coffin-sized crack waiting out a storm. After that, I emerged with a renewed passion for mountains and a reverence for my climbing partnerships. That experience exposed me to a wider circle of climbers and new friends. Tim Halder was one of them. Halder and I planned a trip to the Sawtooths this summer to climb classics and fish in alpine lakes, but when I asked if he wanted to explore the southern Pickets, he responded, "Yes, sir!" So on July 3, we headed up Goodell Creek to a bivouac at the scenic col below Chopping Block and overlooking Crescent Creek. We eyed the easternmost tower of the Rake (7,840') as a warm-up climb. I had been told it was unclimbed. The short tower looked like a good introductory route to get reacquainted with the Pickets. The next morning we climbed snow up a gully to the pass between Mt. Terror and the Rake and scouted our options. The rock above the pass appeared difficult, forcing Tim to lead up left on loose terrain. We continued for two more pitches on better rock, then simulclimbed to the summit. We saw no evidence of a prior ascent and figured it was a possible first ascent. Roper later informed me that he climbed it in 1984, naming it the Turret. We were indeed picking up his scraps. We spent the next day scoping the big South Face of the Himmelhorn, originally called Himmelgeisterhorn, meaning "Horn of the Sky Spirit," from wildflower-strewn meadows. 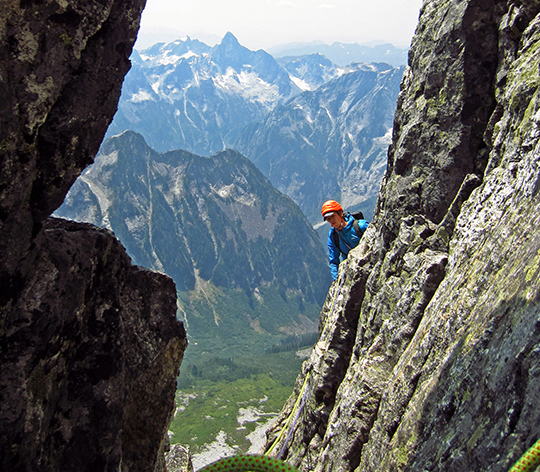 The peak is ascended every couple years, by either the standard route put up by Ed Cooper, George Whitmore, Glen Denny and Joan and Joe Firey in 1961, or the highly regarded Wild Hair Crack climbed by John Roper, Silas Wild and Russ Kroeker in 1981. We saw several options on the complex face, including a left line up a steep dihedral, then a long traverse around pinnacles on the summit ridge. But a direct line up the face looked the best, finishing on the upper summit tower. We left camp at 4 a.m., July 6, under clear skies, climbing snow and then third-classing up ramps and ledges to a grassy saddle where we tied into the rope. Above rose a feature we called the Shield. Tim led blocky, intermediate terrain for the first pitch, then I set off up a dihedral. I cleaned the lower part of a crack, revealing perfect hand jams, but higher it became wide and unprotectable. I traversed left, then laybacked and jammed a good crack (5.10-) to a belay stance. The rock quality improved as we climbed higher, with solid moves and good protection. The third pitch was a fourth-class scramble. The fourth pitch climbed a crack system, which included a thin right-facing flake (5.8)—we called this section Tim's Flake—followed by a short right-traversing pitch (5.6) to the base of the summit tower. I lobbied for climbing straight up, thinking we could find a line that would take us to the top in a couple pitches. I led the steep sixth pitch, finding a cruxy traverse with sloping footholds (5.10-), then the good protection vanished. 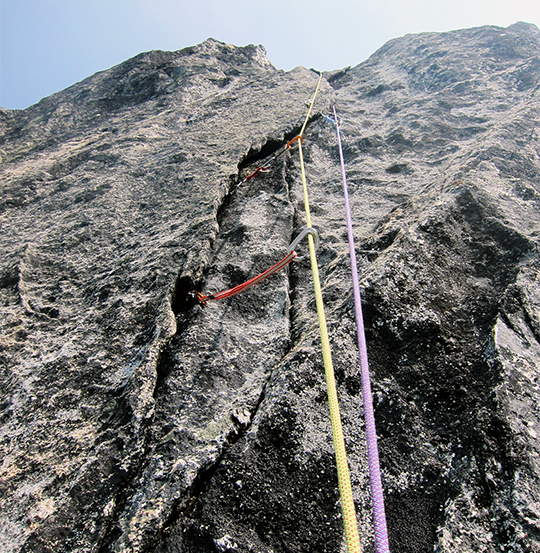 I edged up runout rock toward cracks and a belay ledge, aiming for a crack 40 feet above my last piece of gear. The steep rock above the belay appeared tricky with sparse protection, so Halder traversed up right (5.5) across the upper buttress to a notch on a ridge. After whooping, he brought me up to the belay. We climbed a last pitch up deteriorating rock (5.0) to the summit. On top, I spied an old Kodak film canister. Inside was the original summit log from September 1961 as well the signatures of the 1981 Wild Hair Crack first ascent party. We relaxed on the summit for an hour, happy with the great climbing on our route Stonehenge (5.10, 8 pitches, 1,400'). Sitting in the sunlight, I felt reassured that Roper had left a few blank canvases untouched in the Picket Range and that more walls still await the human touch.